The fashion blogger is the one who runs a fashion blog. Is it this? Not at all. A fashion blogger is a person who is deeply into the trends of the fashion world, be it clothing, accessories or color matching. That person then shares his or her reviews, comments opinions on a platform which is commonly known as a blog. If you are thinking to be among them, you must get inspiration from the top amongst them. Hopefully, you would have learned how to start a fashion blog from our previous post, now you need high flying fashion bloggers to follow. At least one fashion blog is created in every half of a second, somewhere in the world. But the one with sound skills and knowledge stands out amongst the crowd. Following are the top fashion blogger to follow. Amber Fillerup Clark is the blogger behind this phenomenal fashion blog. She influenced her audience by the casual way she adopted, which clearly showed her passion for fashion. It is a great blog to learn how to bind your audience with you and be authentic with them. 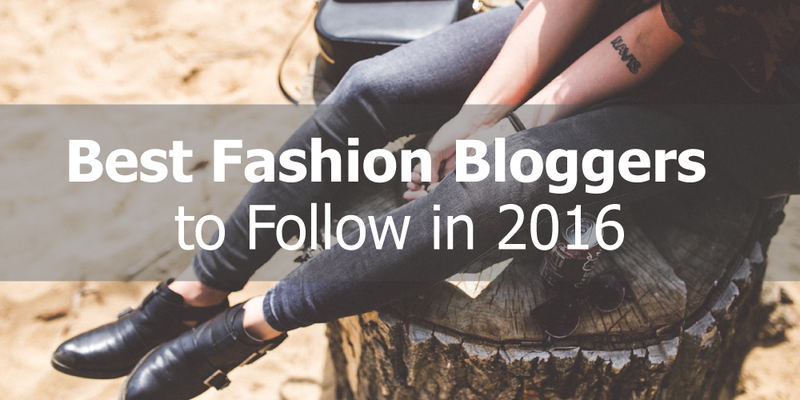 This was one the most followed fashion blog of 2015. Emily Shuman, a professional in the fashion industry, though, she was more successful in fashion blog i.e. Cupcakes and Cashmere. The reason is the way she shined herself in the crowd. She is the fashion blogger to follow to learn how to beat the competition. This famous blog was started by Los Angeles-based fashion designer Jacie Duprie in 2009. Her success took very slow take-off, it was 2012 when she attracted millions of visitors. It was her consistency which enabled her to achieve what she dreamed of. The way she sticks to her goals must be learned from her blog. One of the hottest fashion blogs, started by Julia Engel in 2011, for the purpose of collecting ideas and experience in her college. Later in 2013, the blog turned out to be a huge hit in fashion blogging. What she did was only the reflection of her passion and few technical know-how. She is the highly recommended fashion blogger to follow for inspiration. This marvelous blog is the creativity of a twenty-year-old girl Kristina Bazan. From fashion to travel, she shares every excited walk of her life in a way to keep her audience following her in every aspect. They way she made her distinctive in the crowd is must to learned by the newcomers. All of the above mentioned Fashion Blogs are one of highly visited and influential blogs worldwide, yet they achieved this feat through different strategies and methods. But a common reason for their success is how they worked on to show themselves, their portfolio and their passion. They all did so by faring well with their SEO. Do you think these blog would have been renowned if they were not successful with SEO of their blog? Of course not. How would people have knew them if they hadn’t made them visible to them? Even now if you search on your browser for the fashion blogs, these will be the first to be shown. This clearly shows how SEO is important for the success of any blog. These bloggers surely have either sound SEO skills or an SEO expert who read SEO Whitepapers. Thus, you can also be among the top fashion bloggers if you follow the guidelines provided by Webtexttool. Marketing Blogs are also a good option along with fashion blogs for new bloggers. Read webtexttool’s guide of top Marketing blogs to follow to get an overview of them. Remember that getting inspiration from these top bloggers is an important factor to kickstart your blog. However, every single moment of your hard work will be wasted if you didn’t show up what you have got. You know SEO is a must for that. Webtexttool is always there to shine your passion from the crowd. Fashion Bloggers are celebrities today in their own right and have huge fan following. Followers like, share, comment on their updates and that for me creates a great social vibe for them as well besides the important points mentioned by you.